Home > Hunting > Think Someone is Hunting Illegally? What Should You Do? It is clear that the Hunting Act has had a significant impact on some countryside-dwellers’ lifestyles. The outlawing of hunting with dogs was hotly contested and, at least to begin with, there were many cases of wilful disobedience. Today, cases of illegal hunting are relatively rare. But if you suspect that someone is breaking the Hunting Act, you should take action. It is illegal to use a dog (or dogs) to hunt wild mammals. Primarily, this means that fox hunting is no longer legal. But it is important to note that fox hunting is not the only pursuit that has been affected. In the eyes of the law, it doesn’t matter whether or not the intention is for the pursued animal to be killed. It is illegal t chase a wild mammal with dogs even if you intend only to catch it. There are certain circumstances in which hunting is allowed. If you think you have seen the illegal use of dogs to hunt, you may first wish to consider whether any of the following exemptions apply. ‘Stalking’ and ‘flushing out’ are still permitted under the law. Up to two dogs can be used for this purpose; if three are used, it is illegal. 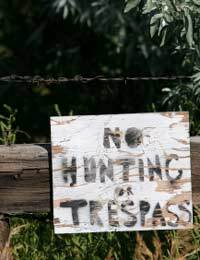 Stalking and flushing out are only permitted in certain circumstances, for example when the purpose is to preserve an area’s biodiversity, or to prevent damage to livestock. It is also still permitted to use dogs to hunt rats and rabbits. Of course, to an observer it may be difficult to determine what the quarry is. Who should I report hunting to? If you think you have witnessed illegal hunting, or if you have grounds to believe that illegal hunting is taking place, you should contact the police. Don’t call 999 unless it is an emergency; instead, call or visit your local police station. Some people call the RSPCA or other animal welfare charities if they think hunting is going on. While animal welfare organisations will certainly be interested to hear of it, your first port of call should be the police. There are stiff penalties for those who fail to abide by the Hunting Act. There are provisions for a fine of up to £5,000 for those who break the law. In addition to this, the courts may choose to take other action against hunters, particularly if they believe that there is a risk of a repeat offence. They might, for example, remove the dogs that were used in the hunt. They can theoretically also confiscate other equipment that was used to assist the hunt. You should also bear in mind that individuals who knowingly allow their land to be used for illegal hunting are themselves breaking the Hunting Act. Again, stiff penalties apply. At all times, it is important that you do not put yourself in danger. Rather than confronting suspected hunters yourself, call the police – they are trained to deal with these situations.